In all the realm, punctuality is the courtesy of the Kings. Oh surprise... our English friends who still have a Queen were not able to respect this saying when they came in June. Expected around 23.30, by 22.00 we were almost all in the canteen to welcome our friends ... and the time passed ... passed ... until 01.30 when, at last, they appeared ... The formalities, the crossing, the driving on the right had been a little more laborious than foreseen ... but they were here! The next morning, we reconvened for a reception in the marriage room of the Town Hall and the engagement became official. The afternoon, under a brilliant sun, everyone at the School Fete where many English and French players gathered at the A.B.A.I., hoop-la stall. The two tee shirts from Colney Heath were awarded to the most skilful ones. The evening, under the chestnut trees in the school playground, the sheep barbecue, with "surprising" sauce, the dance and the Rosé wine maintained the good mood until late in the night. 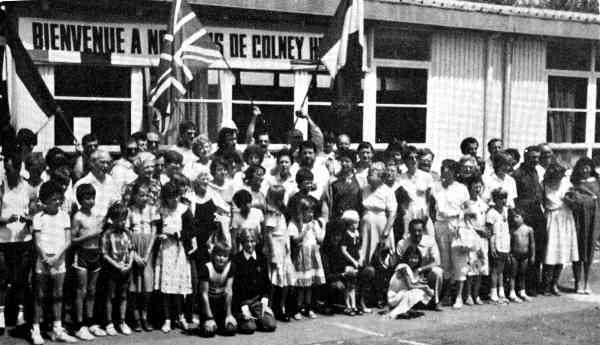 We thank the teachers of Boissy for the welcome that they gave to our English friends at the school fete. On Sunday morning, visits around Boissy and Paris for some courageous ones. After the souvenir photo, departure of our friends is a not very early one at 12.30, but it is only an au revoir.